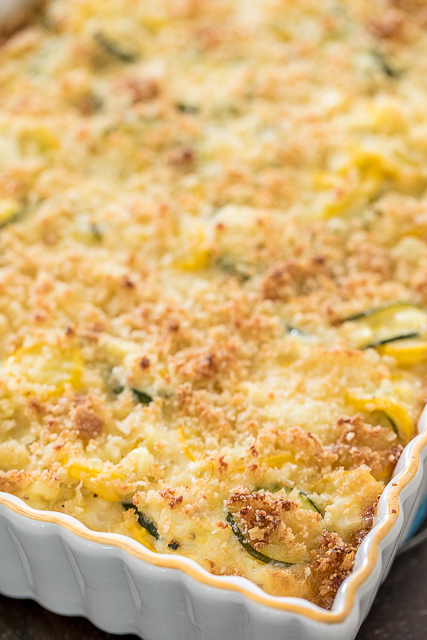 We are obsessed with this delicious Zucchini, Squash & Corn Casserole. Fresh veggies and cheese are hard to beat! We've made this several times over the past month and it has been a hit every time. We really like it with grilled chicken and burgers. 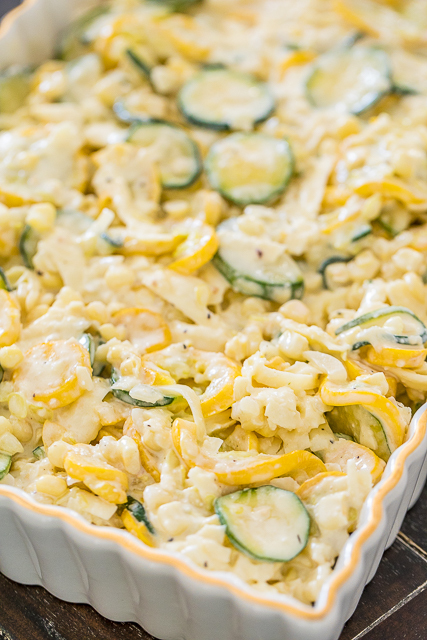 This Zucchini, Squash & Corn Casserole can be made in advance and refrigerated overnight. I've even divided the casserole between two foil pans and frozen one for a quick side later. This recipe uses "fresh breadcrumbs". To make fresh breadcrumbs, just pop some bread slices in the food processor and pulse it a few times. I used homemade bread, but any type of bread will work just fine. 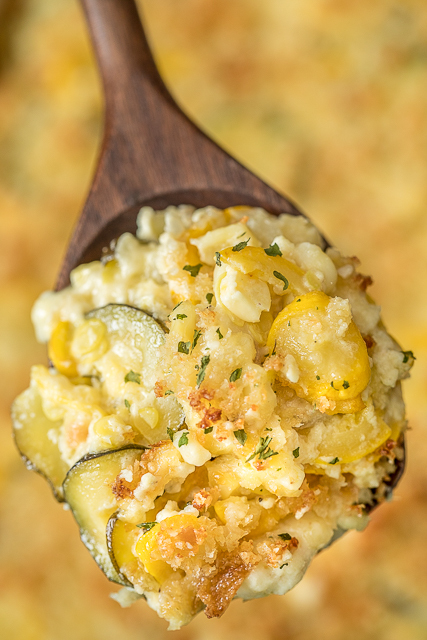 This Zucchini, Squash & Corn Casserole is going to be a staple in our house this spring and summer. 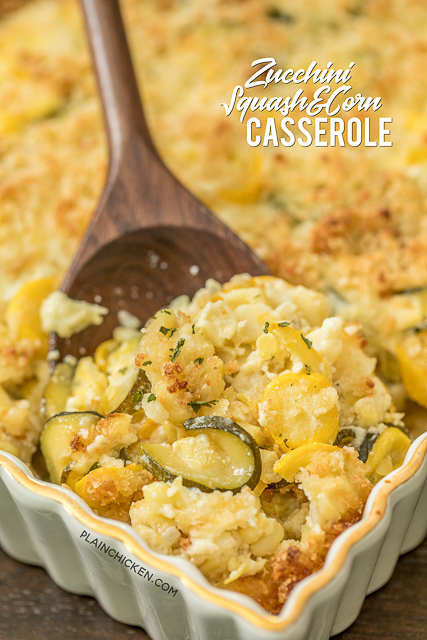 This casserole is great for potlucks and cookouts. We are serving it this weekend with our Easter ham! Preheat oven to 350ºF. Lightly spray a 9x13x2-inch pan with cooking spray. Melt 2 Tbsp of butter in large skillet over medium-high heat. Add zucchini, squash and onion. Sauté for 10 minutes, or until tender. Add garlic and cook and additional 2 minutes. Remove from heat. Stir together cooked zucchini, squash, onion, corn, white cheddar cheese, sour cream, mayonnaise, eggs, salt and pepper. Stir in 1/2 cup of breadcrumbs and 1/2 cup of parmesan cheese. Spread mixture into prepared pan. Melt remaining 2 Tbsp butter. Combine melted butter, remaining breadcrumbs and parmesan cheese. Sprinkle over casserole. Bake uncovered for 45 to 50 minutes. Doing Keto diet...any good subs for corn or would still be good sans corn & breadcrumbs?? Cauliflower rice for the corn, and crushed pork skins for the bread crumbs ! Can you make it ahead and bake it later? How much extra time if it was refrigerated? Blending the two types of squash together with the cheese and corn does make a very pretty dish. It also sound delicious and very easy to prepare. I, too, would like to serve this with Easter dinner. Guessing you use frozen corn kernels this time of year? Any good substitutes for the mayo? Plain greek yogurt at a 1:1 ratio. Can sub for both mayo and sour cream. Greek yogurt was what I was thinking - you can add more protein that way. Do you think white beans could substitute for corn? Although I like the cauliflower idea too. Made it this weekend. Delicious! If you want to freeze it’ do you bake first or freeze first? I don't bake it first. I just freeze it. How much does this make? It looks delicious! I'm on weight watchers, so I like to know how much it makes to figure out how many points per cup/other serving size. Thanks for helping with this! about how much squash is 1 1/2 lbs? I found it was three average size ones. Looks like fresh herbs were added. I plan to use chives or green onions instead of the sweet onions. Maybe the green is from breadcrumbs? I feel like I'm missing something!! Looking forward to making this tonight!! After you cook the veggies, there is so much liquid. Do I drain the liquid first? If you have a lot of excess liquid, I would suggest draining it off. This was a pretty tasty casserole! It had a slightly weird aftertaste--perhaps the mayo I used. It's a little high in calorie for me to make very often for lunches, since it does have the mayo, sour cream, and breadcrumbs. But, it reheats pretty well, and I didn't get tired of it for a whole week of lunches. Overall I did like it. Next time I will cook the veggies in 2 batches. It was just too mutch even though I had large pan. I also had lot and lots of liquid after cooking the veggies, I am so glad you mentioned it, I thought I had done something wrong. Perhaps cooking them quicker and at a higher temperature may help! This was delicious. I want to make it again but freeze halfWhen you freeze it, how do you cook it? Do you thaw first or place directly in the oven froze? What temp and how long? Delicious! Won’t cook the veggies as long, maybe 3minutes. My family couldn’t get enough! I'm thinking I would love to add chicken breasts to this and make it a meal. Stay tuned! Made this a few nights ago and I LOVE it! I halved the recipe and it worked out just fine. I might add some ham chunks to make it a one-pan meal, or serve alongside ham. Might also try leaving out the corn and increasing the squash. Normally I do not eat leftovers (just one of several quirks) but am on my second day of them and finishing it up right now! Really delicious as is, thank you for posting!! This was really tasty, but it made a TON of food. If I made this again I would only do a half batch because we just couldn't get through it all. Perfect if you're feeding a crowd. Do I need to dry the bread out first before putting in food processor? I want to make the fresh breadcrumbs. Thanks ! Doing it later today! I usually use a day old loaf of French bread. If the bread is super fresh, I might pop it in the oven for a few minutes to dry it out. Could this be made in a crock pot? Lightly salt the slice squash/zucchini on top of paper towels to release excess liquid. Let set about 15 min. Then dab the excess salt/moisture of the top of squash with paper towels.